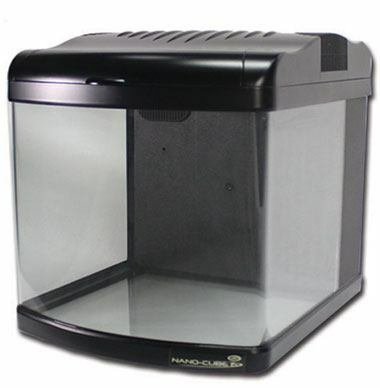 For those who want the convenience of a small tank and the beauty of a big aquarium, get the 6 gallon nanocube. Fish and aquatic plants will love this tank. The dimensions will provide enough space for proper rock stacking in a mini-reef tank. Enjoy a beautiful panoramic view with the aquarium's rounded corners. Inconspicuously concealed with a newly redesigned filter for better surface skimming. 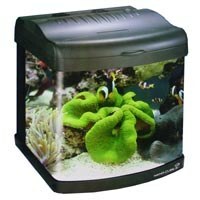 Offers maximum space for fish, plants, and corals. All Nano Cubes now incorporate an output return nozzle for directional flow control. Features a 106 GPH submersible pump. Mechanical - Sponge filter debris and free floating particulates. Chemical - Activated Carbon bag eliminates dissolved waste and odor. Biological - Ceramic Rings & Bioballs provide the perfect environment for beneficial bacteria in FISH ONLY tanks. Our redesigned canopy includes (2) 50x50mm cooling fans that draw out the heat generated by the lamp before it has time to warm up your water temperature. Our exceptional canopy draws air in through the sides and pushes the warm air through our ventilated reflector and up through the fans for a cool running tank. Our canopy sliding track allows for easy lifting and securely holds the canopy in place for routine upkeep. The front of the top flips back for quick feeding. Features (1) 18 Watt 50/50 CF lamp for daylight operation and (2) Nite-Vu LED moonlights to simulate a rhythmic nocturnal shimmer. Contains an integrated energy-saving electronic ballast within the canopy and one toggle switch to control both the fluorescent lamp and Nite-Vu LED moonlights. Installed with a German socket lamp holder for easy bulb install and replacement. A replaceable clear splash guard protects the lamp, ballast, and fans from moisture and water contact. JBJ has done it again with the all glass Nano 180 aquarium. Tank is IN STOCK. MT-302 8 gallon.